Over the last decade or so we have seen a huge shift in the mindset of those deeply entrenched within the fitness industry, moving towards a more holistic health approach that looks at the body and health as one whole unit rather than as a collection of individual parts. With this has come an abundance of research demonstrating that the health of the digestive system is strongly linked to the health of the entire body, showing associations with cardiovascular health, weight gain, metabolic health, immune system function, and even cognition. It truly is one of the most important aspects of the entire body. With this has come a number of digestive health supplements, aimed at enhancing the health of the gut, and subsequently influencing the state of the body in a big way. And one such supplement that has been shown to have profound effects on both gut and global health are digestive enzyme supplements. What are Digestive Enzyme Supplements? Digestive enzymes are a type of complex protein that are made by your body, and live within the digestive system. These enzymes assist breakdown large pieces of food into smaller molecules so that they can be easily absorbed by the body. Most of these enzymes are made by your pancreas, although some are made within the stomach, mouth, and intestine. Taking all of this into consideration, digestive enzymes are also integral to the absorption of nutrients throughout the entire digestive system, while obviously assisting in the absorption of essential fatty acids, carbohydrates, and proteins. Through these interactions, digestive enzymes play a very important role in ensuring that the body has adequate energy and nutrients available o function effectively – with a reduced number of these enzymes demonstrating an associated decline in health! With this in mind, digestive enzyme supplements are exactly what they sound like – supplements that contain digestive enzymes. What are the Health Benefits of Digestive Enzyme Supplements? Given the apparent importance of digestive enzymes within the body, their benefit may seem quite obvious. As a result, we wanted to take a quick look at the research to outline what the best health benefits associated with taking digestive enzyme supplements truly are. Do Digestive Enzyme Supplements Help Irritable Bowel Syndrome (IBS)? IBS is one of the most common digestive issues to plague modern society, and resulting in severe abdominal cramping, mucous within the stool, diarrhoea and constipation, and severe bloating, it is also one of the most unpleasant. While its exact cause remains unclear, it has been hypothesised that an inability to breakdown and digest complex food molecules can result in irritation and damage to the walls of the intestine, leading to IBS symptoms. Building on this, the supplementation of digestive enzymes has been shown to enhance digestion and reduce the signs of digestive discomfort in people with diagnosed IBS , suggesting an excellent treatment option for these individuals. Do Digestive Enzymes Help Leaky Gut? Leaky gut describes a digestive issue that occurs when the digestive system become porous. When this occurs, harmful compounds and undigested food molecules can pass freely through the digestive system and into the bloodstream, wreaking absolute havoc with the body, and causing a host of negative health implications. In a similar fashion to the above, the consumption of digestive enzymes supplements can aid in the breakdown of complex food molecules and subsequently reduce the amount of stress placed on the intestinal wall. This is highly likely to enhance gut and digestive function, therefore assisting in the treatment of a leaky gut . Do Digestive Enzyme Supplements Enhance Nutrient Absorption? As previously mentioned, digestive enzymes breakdown large food molecules into smaller molecules, making them much easier to digest. This makes the vitamins and minerals within the food we eat much more available to the body, in which they are absorbed much more efficiently. Through this interaction, digestive enzyme supplements not only reduce the risk of malnutrition, but also enhance global health by ensuring the body has essential nutrients readily available for use at all times . Do Digestive Enzymes Supplements Help Inflammation? Inflammation throughout the body has been shown to place extreme stress on its physiological systems, resulting in an increased risk of immune system dysfunction, cardiovascular disease, dementia, and even diabetes. Interestingly, recent research has demonstrated a clear link between digestive health and systemic inflammation, in which a healthy gut can reduce the amount of inflammation within the body. With this in mind, the supplementation of digestive enzymes may offer an excellent method of improving gut health and reducing systemic inflammation. Through this interaction, they are highly likely to further enhance all facets of health, while also increasing immune system function . Considering the positive impact that digestive enzyme supplements can have on health, we wanted to give you some great options that you can implement into your routine immediately. 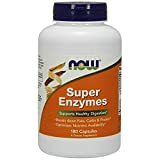 This digestive enzyme supplement by Zenwise is hands down the most popular option on the market, with well over 5000 reviews on Amazon – and for good reason too, as it is also one of the most effective. This truly offers an excellent option for those individuals looking to enhance all facets of digestive health and function. NOW are a great company that have built an excellent reputation for producing high quality supplements using scientifically supported ingredients, while offering them at affordable price points – and their digestive enzyme supplement is no different. Using an array of effective digestive enzymes, this is a great option for those looking to enhance digestive health without breaking the bank. This final option by MAVnutrition has been incredibly well received by the health community, with many suggesting to see immediate improvements in abdominal comfort and digestive health. Providing an abundance of key health boosting enzymes, this is an extremely potent option that can guarantee huge improvement in health and function. By improving the body’s ability to breakdown and digest the food we eat, digestive enzyme supplements are a great option for those looking to enhance health and function, while also causing large reductions in inflammation and huge improvement in gut health. The three products listed in this article are what we believe to be the best digestive enzyme supplements available on the market at the moment, each of which offer an excellent option in their own right. As always, if you have had any experience with digestive enzymes we would love to hear about it, so please drop us a comment and we will get back to you ASAP.